Israel Folau of Australia runs with the ball. 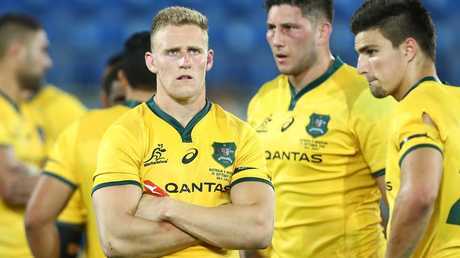 A FRACTURED ankle for Reece Hodge will likely force Israel Folau to fill in at outside centre for the Wallabies in Saturday's Test against the All Blacks in Yokohama. The cascading effect of the third injury to an unlucky Wallabies No.13 this season could be even more striking with 18-year-old rising star Jordan Petaia certain to be called up for the European leg of the tour and the possibility of an SOS to veteran Adam Ashley-Cooper. Such is the injury toll in the specialist position that Samu Kerevi is certain to play off the bench, at least, in Yokohama. The 21-Test powerhouse is just the sort of direct running that the Wallabies backline needs but his only rugby in three months was for Brisbane Fiji in two matches at the Byron Bay Sevens on Saturday. Wallabies coach Michael Cheika will be glad he gave Kerevi that smart option to find some confidence to run and tackle in the rhythm of a game after twin surgeries to repair a torn bicep and wrist tendon. 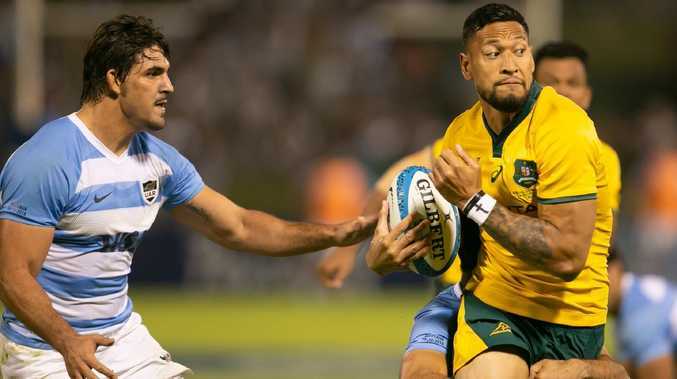 Fullback-winger Folau is still the standout option to start at No.13 for the first time in a Test because he's played there in certain set plays for the Wallabies and NSW Waratahs over several seasons. "Reece is going to have a few months off his feet with a fractured ankle. We're not going to rush anyone to Japan but reflect on who we need for the European tour section because we'll need an extra back," Cheika said. "Samu will play at least some part in things this weekend. Yes, he's underdone but we're going to build him up as the tour goes on." Hodge injured his ankle at training in Sydney last Friday while back-up flanker Angus Cottrell (knee ligaments) will miss the Japan leg but is some chance of touring Europe. Canberra Vikings backrower Pete Samu will fly to Japan to cover the loss of Cottrell. Reece Hodge will miss several months with injury. Cheika was talking from the northern Japanese city of Sapporo, where he made a hit-and-run visit on Sunday immediately after his arrival in Tokyo with his squad. The visit was to inspect the 41,000-seat Sapporo Dome, the state-of-the-art indoor-outdoor venue where the Wallabies will play their World Cup opener against Fiji on September 21 next year. "It's like a spaceship. Playing there indoors is going to be really special because the way it transforms from a baseball field to one for rugby or soccer is like no other I've seen," Cheika said. Ashley-Cooper is the wildcard at 34. The 116-Test back qualifies for Wallabies selection through the Giteau Law and his intention to re-sign for the Waratahs next year is the strong signal that he is committed to chasing selection for a fourth World Cup. He is playing for Kobelco Steelers in Japan so joining up would be smooth and to cover an emergency with his versatile outside centre-winger skills. Project backrower Isi Naisarani, the big, ball-running Fijian, may be taken to Europe as a development player even though not yet eligible for the Wallabies, Cheika said. Last Friday, Rugby Australia chairman Cameron Clyne said Cheika's coaching reign to the World Cup was rock solid, saying "we support him absolutely" and that the side had "extraordinary potential". "Potential doesn't win trophies. Everyone likes to look at the bad bits but there has been a lot of the good this season too," Cheika said. "More consistent rugby is without a doubt what we want ... a longer version of the second half in Port Elizabeth and the second half in Salta against Argentina. "Against the All Blacks, we have had good periods too and those extra bits of concentration pre and post halftime when there have been a number of scoring movements (from the All Blacks) is really important.